Feature extraction (FE) or dimensionality reduction (DR) plays quite an important role in the field of pattern recognition. Feature extraction aims to reduce the dimensionality of the high-dimensional dataset to enhance the classification accuracy and foster the classification speed, particularly when the training sample size is small, namely the small sample size (SSS) problem. Remotely sensed hyperspectral images (HSIs) are often with hundreds of measured features (bands) which potentially provides more accurate and detailed information for classification, but it generally needs more samples to estimate parameters to achieve a satisfactory result. The cost of collecting ground-truth of remotely sensed hyperspectral scene can be considerably difficult and expensive. 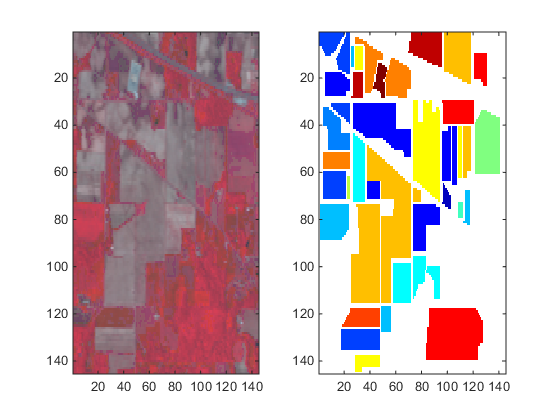 Therefore, FE techniques have been an important part for hyperspectral image classification. Unlike lots of feature extraction methods are based only on the spectral (band) information of the training samples, some feature extraction methods integrating both spatial and spectral information of training samples show more effective results in recent years. Spatial contexture information has been proven to be useful to improve the HSI data representation and to increase classification accuracy. In this paper, we propose a spatial and spectral nonparametric linear feature extraction method for hyperspectral image classification. The spatial and spectral information is extracted for each training sample and used to design the within-class and between-class scatter matrices for constructing the feature extraction model. The experimental results on one benchmark hyperspectral image demonstrate that the proposed method obtains stable and satisfactory results than some existing spectral-based feature extraction. K. Fukunaga, Introduction to statistical pattern recognition, 2nd ed., New York: Academic Press, 1990. R. O. Duda, P. E. Hart, and D. G. Stork, Pattern classification, 2nd ed., New York: John Wiley & Sons, 2001. S. J. Raudys and A. K. Jain, “Small sample size effects in statistical pattern recognition: recommendations for practitioners,” IEEE Transaction on Pattern Analysis and Machine Intelligence, vol. 13 no. 3, pp. 252-264, 1991. D. A. Landgrebe, Signal theory methods in Multispectral Remote Sensing, New Jersey: John Wiley and Sons, 2003. P. K. Varshney and M. K Arora, Advanced image processing techniques for remotely sensed hyperspectral data, New York: Springer, 2004. B. C. Kuo and D. A. Landgrebe, “Nonparametric weighted feature extraction for classification,” IEEE Transaction on Geoscience and Remote Sensing, vol. 42, no. 5, pp. 1096-1105, 2004.
for hyperspectral image data,” IEEE Transactions on Geoscience and Remote Sensing, vol. 48, no. 3, pp. 1279-1293, 2010. Y. Zhou, J. Peng, and C. L. Philip Chen, “Dimension reduction using spatial and spectral regularized local discriminant embedding for hyperspectral image classification,” IEEE Transactions on Geoscience and Remote Sensing, vol. 53, no. 2, pp. 1082-1095, 2015. H. Pu, Z. Chen, B. Wang, and G. M. Jiang, “A novel spatial–spectral similarity measure for dimensionality reduction and classification of hyperspectral imagery,” IEEE Transactions on Geoscience and Remote Sensing, vol. 52, no. 11, pp. 7008-7022, 2014. J.-M. Yang and S.-H. Wei, “Spatial and Spectral Nonparametric Linear Feature Extraction Method for Hyperspectral Image Classification”, AITI, vol. 2, no. 3, pp. 68-72, Nov. 2016.